The Society was looking for greater visibility and promotion for the History Center's Then Now Wow exhibit. According to Laura Geffre-Rick, Community Outreach & Sponsorship Manager, "People love the inflatable! It's been a great photo op for History Center guests." In addition to doing meet-and-greets in front of the Society, the cold air inflatable characters also make appearances to fairs and festivals, grand openings, parades and other events. 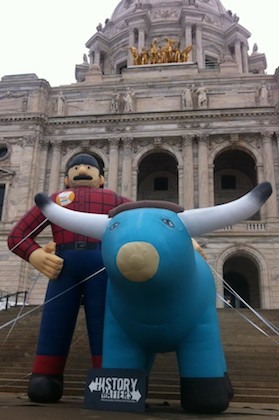 While both Landmark Creations and the Historical Society are both in Minnesota, the Society could have chosen to work with any number of companies across the country. They selected Landmark Creations because they wanted to go local, and they liked the high-quality inflatables they saw in our online portfolio. Have a look for yourself. You just might see something that sparks a brilliant idea. Looking for a clever way to attract visitors? Browse our online galleries!